Should IDUs become their own course? Recently, our school held its annual 3E Conference – a gathering of educators from several continents, all meeting to discuss ways in which we can further push the boundaries of education and support our students to become energized, engaged and empowered. The focus of this year’s conference was on personalized learning and strategies for making learning more connected to the lives of our students. During the course of the conference, I found myself in many conversations regarding the integration of disciplines in order to create more authentic and meaningful learning. For those in the MYP community, IDUs (short for interdisciplinary units), are a requirement – one IDU (assessed using the special IDU criteria) per year level, each academic year. Like so many things in education, IDUs are one of these items that we all philosophically get behind, yet practically, often find difficult to implement (again, it would seem, the enemy may be timetabling). Finding time to plan, implement and assess an IDU can be a bear – to the point where it is potentially a deterrent to the teacher’s developing the unit. So if the logistics behind IDUs are potentially a deterrent to their implementation, why not make “Interdisciplinary Studies” its own MYP course? This may sound silly, but he has a point. While most of us are aware of Finland ditching traditional subjects in recent years in favour of a “Phenomenon based” education, curriculum specialists such as Heidi Hayes Jacobs have long advocated for a greater amount of interdisciplinary learning in schools. “Outside of school”, Jacobs writes, “we deal with problems and concerns in a flow of time that is not divided into knowledge fields…it is critical that students see the strength of each discipline perspective in a connected way”. She said this, by the way, in 1989 – this is nothing new. In fact, you could make the argument that an integrated approach to education is the most authentic way in which we can learn things – in context, with multiple disciplines supporting us to create solutions to problems, express our creativity or satisfy our curiosities. When you are out walking, nature does not confront you for three quarters of an hour only with flowers and in the next only with animals. So how can MYP schools approach building Interdisciplinary Studies as a course of its own? The sky is the limit to how we could approach this really. High Tech High in the United States provides one interesting model, Finland provides another. 1. Interdisciplinary studies could become a rotational subject, experienced in a trimester or semester timeline. This would be fairly easy to plug into a schedule, however, it might make the course seem superficial – more of a “have to do”, hit-and-run experience than a sustained and meaningful approach. 2. Interdisciplinary Studies could become an alternate programme for students who opt-in. These students would naturally spend less time in other disciplines and more time satisfying requirements via more robust interdisciplinary experiences. Schools such as Shanghai American are currently following a model such as this. While this would be a good way to pilot the a new course, it does potentially lend itself to exclusivity. 3. Reduce the number of hours for traditional subjects and have Interdisciplinary Studies make up the majority of a student’s timetable. This would still allow for students to experience disciplinary learning (something Jacob’s highlights as critical to the interdisciplinary experience) and would allow schools to put into practice a framework for learning that is more authentic than traditional models. This might mean the MYP would have to give on its “All strands, twice a year” assessment model, but an argument can be made that the “sacrifice” of less exposure to the disciplinary strands would be more than worth it. In terms of how the course might look on a day-to-day basis, I will again pull from Ms. Jacobs who notes, “Students can, and, when possible, should be involved in the development of Interdisciplinary units”. Within the classroom, we would see students identifying actual problems in their own lives/communities and seeking authentic ways to solve them. Students using design thinking and a process such as the one suggested in The Quest for Learning, to begin to design their own interdisciplinary units and success criteria. In this model, the teacher becomes a servant leader – seeking out opportunities for students to go deeper with their thinking, supporting students in making the necessary connections to local and online experts and liaising with expert teachers in necessary areas of subject integration (it doesn’t take a math teach to recognize when math might be needed in an IDU). In this model, teachers don’t need to be subject experts, just experts in supporting students to design their experience, connect with relevant experts and reflect on their indicators of success, by facilitating co-assessment between the student, experts and teacher. Eventually, this course would not only promote more authentic learning and increased empowerment of learners, but may potentially push schools towards offering flexible timetables, purpose-built learning spaces and a community approach to teaching – one that goes beyond “team teaching” and extends into “it takes a village” territory. Considering that life never presents itself to us in a silo-esque way, why should we present learning in this way to our students? How does your school handle IDUs? What ways are you looking to increase student involvement in Interdisciplinary learning? I am personally going to advocate to facilitate an Interdisciplinary Studies course option to be put into place at our school during the next academic year. I am excited to hear the feedback I get and will share any progress. Elvin, L. (1977). The Place of Common Sense in Educational Thought. London: Unwin Educational Books. Jacobs, H.H. (1989). Interdisciplinary curriculum: Design and implementation. ASCD. Perhaps the convergence of all of this creative energy is making this issue more apparent, but right now, my students are definitely victims of a timetabling system that is an antiquated practice and certainly an enemy of creativity and deep learning. Would a real filmmaker, preparing her work for submission to her production company say to herself, “Ok…today I will work on my film from 9:00-10:30, but then at 10:30 I have to stop because then it’s time to do some math”? For that matter, would a real mathematician say, “I’m going to gather insights into this data, but only for ninety minutes because then I have to go edit a film”? This is the inauthentic world of timetabled learning that we have created in schools. A world where creativity – a slow process in any discipline – is cut short because…because a piece of paper you got on the first day of school says it has to. So when children are trying to write a story that they have invested themselves in emotionally, or are completing a film that they are planning to show to a wide audience of peers and community members, they are forced to do so in these arbitrary, predetermined chunks of time – whether they want to or not, whether they feel like it or not. Have a great idea during a time not designated for that type of thinking? Too bad, you have a schedule to keep. This type of traditional school-driven timetabling is as old as schools itself and is designed for logistical ease – not for student learning. What are the side effects of school-driven timetabling when students are involved in deep learning? On one hand, it forces children into the ridiculous need to shift their ability to be analytical, be creative, be physically active, at the snap of a finger. It perpetuates a, “good enough” attitude from students who end up creating not what they really wanted to, but a reasonable facsimile that satisfies the requirements of the time constraints that have been determined for them. It doesn’t allow for slow thinking of any kind – reflection, adjustment, seeking feedback and fine tuning – that all creators would say are integral aspects of high-quality products. The good news about timetables? We’ve created them, so we can destroy them. We can leverage technology to offload the need for a lot of traditional “lessons”, which would free up time for teachers to move more towards the role of consultant, mentor and coach. We can create environments like this one, or this one where students create their own timetables based on need and interest, not based on arbitrary decisions from the timetabling robot that spits out a schedule for them. What would the side effects of a student-driven timetable be? First of all, learning how to manage time. We often lament that time-management is a skill that is lacking in many students – of course it is, we manage the majority of their time on their behalf. Turning the timetable over to the students would allow them to take ownership over this process and free up teachers to support students with strategies on how to manage their short and long-term goals. Secondly, a student-driven timetable would support students in learning the key skill of prioritization. There are literally endless books and blogs dedicated to the art of prioritizing and managing one’s daily list of “to-do’s”; perhaps this wouldn’t be such a common stressor if we learned and used these skills as we were growing up. A student-driven timetable would give children the space and freedom to go deep, to truly sink their teeth into their learning, to “get it”, to have those moments of wonder and accomplishment and to learn that, often, the things we are the most proud of are the things that we really put our heart and soul into – often for more than 60-90 minutes two to three times a week. Finally and most importantly, a student-driven timetable says to children, “you matter”. It says, “you are able to be the driver of your own learning”. It says “your time belongs to you”. Empowering students to manage their time and projects is a kinder, more humane, more authentic approach to learning and creating – one that we should be advocating for on behalf of our learners. If they had the choice, they’d be at this all day. Shouldn’t they have that choice? This brings me back to where I started…the two students I mentioned at the beginning of this post? They are still sitting beside me, completely in flow and completely content. One just said to another, “Wow, we’ve been here for hours…it’s nearly six o’clock”. They want to keep going, but they have to go home to eat dinner. I’m sure if they had the choice, they would have spent their entire school day perfecting their creation, so they didn’t have to spend their after school time doing so. If they were only given the time. We talk about how vital they are to student success. We come up with intricate plans to sequence them. Hell, Gangstarr even wrote a whole song about them. But do students, as Guru puts it, feel it when we drop those? As education (or a small subset of education) realizes that the traditional content-based approach to teaching and learning is increasingly becoming obsolete, skills make their way to the forefront of many discussions around pedagogy in the 21st century. In IB schools, we have (or should have) a massive focus on what we call Approaches to Learning (ATL) Skills. These permeate all three IB programmes and are central to the learning experiences students should be engaging with in class. These skills are often the focal point of our lessons and assessment, however – much like content – choice around skill development often rests with the teacher. I struggle with this regularly. There are skills I know my students need in order to be successful on a variety of levels – socially/emotionally, to be a discerning member of a digital world, to keep themselves organized, or to pass their DP exams. I identify these skills and design pathways by which students can become more proficient in using the skills I have so lovingly identified on their behalf. No harm intended. After all, I’m wise and have my students best interests at heart. What I think I’m missing out on though, is the opportunity for student to identify, for themselves, what skills they would like to learn. I’ve taught a lot of subjects within the IB framework – Mathematics, Language and Literature and Media – and I see them all as “skill based” subjects. In fact, we could look at the ATL skills as being “macro” skills with the more subject-specific skill set being “micro” skills. When looking at the IB’s recommend list of ATL skills, we can notice the opportunity for macro skills to beget micro skills. Using Media as my test subject, I’m about to try out a framework whereby we blend both models of skill development – both student and teacher chosen ATL skills. Our first step is to ensure students are equipped to plan towards their own intended learning outcomes. We will look at the philosophy of backwards design, setting success criteria, reflecting upon and adjusting those criteria (hello Personal Project) and using digital tools such as Outlook, ManageBac and our mobile phones (“There’s a calendar on my phone?! ?”) to set incremental and key deadlines. Step two is to look at some of the characteristics that make good and not-so-good resources for learning filmmaking skills online. Pretty much everything you’d ever want to know about filmmaking can be found on YouTube, however some of this information is presented very well and others…need improvement. We also need to look at scenarios in which (gasp!) a written or even (double gasp!) human resource might be superior to an instructional video. A key idea here will be that of synthesis. It is paramount that our students are taking the ideas from multiple sources and using them to fulfil their own creative intentions, not simply regurgitating the work of others. Step three will come towards the end of our unit where we will examine the variety of ways in which we can use our newly developed skill set to support those who might benefit from it. Screenwriting? Costume design? Lighting? Audio effects? Whatever their area of interest, students should now hopefully feel empowered to learn the micro skills that interest them. As an aside, isn’t this the whole point to the Approaches to Learning Skills? That students, once equipped with a variety of these skills can be empowered to drive their own learning, confident in the notion that they have, not only the skills to learn, but also the skills to evaluate whether or not that learning is helpful for them to achieve their goals? It’s foolish to think that all learning can be planned in advance. 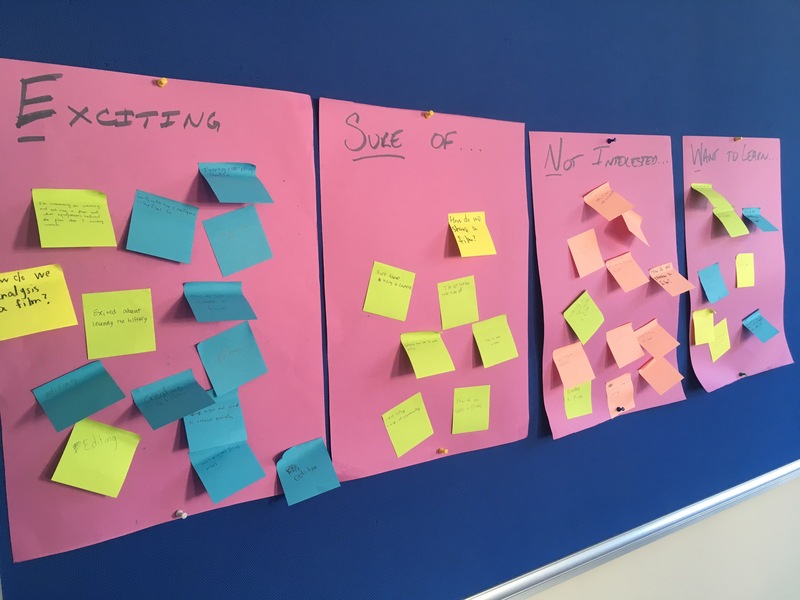 As students work their way through this process, a variety of other ATL skills will almost certainly be developed – something that can be noted and discussed on a student-by-student basis. Here is where I think I get carried away sometimes and have my students over-reflect. In the past, I’d have them retroactively take a look at the entire ATL skills chart and identify further skills they’ve developed. This time, I’m going to take a much more casual approach, as I’ve found in the past that a more rigid reflection leads to even greater instances of teenage groans and further alienation from the process of ATL skill development. I’m excited for this unit. Not only because my students can have a large degree of say towards that which they are learning, but because they are all going to learn something that matters to them. So unlike a more traditional assessment (I’m looking at you essays), students will hopefully be more inclined to be proud of what they have done because it is personally relevant. Of course, I hope the big-picture takeaway from this experience is that my students feel empowered with a process that will allow them to direct their own learning in the years to come. But if, in the end, their big takeaway is that they got to learn something they wanted, in a way they wanted and then do something personally relevant with that learning – I think that’s a win too. Hopefully this balancing act between skills I have chosen and skills the students have chosen works out to be a framework I can use in my other, perhaps more traditional, teaching areas. I’ll update on the process, successes and drawbacks as the unit progresses. What are some of the ways that you have found to engage students with learning macro or micro skills? Do you have a framework for supporting students’ skill development? Please share! This year I have the privilege of working with a group of MYP 4 students to usher in our fist media class ever. Up to this point, we have spent the majority of the year setting the table for things to come – generating ideas about what we’d like to learn, building our course outline, inquiring into our assessment objectives and what we might to to reach those objectives and identifying the ATL Skills we will probably need to focus on developing over the course of this year. As one of the topics students expressed interest in learning was a bit of film history, we have started our year looking at some of the earliest forms of cinema. This included a one-class filmmaking challenge, where students had to attemp to recreate any scene from Georges Melies’ 1902 classic A Trip to the Moon. Not only was this a fun and humbling project (“I thought old movies didn’t have any effects”, one student said), but it was a great diagnostic tool for my students to see what they knew about using video editing software and what they still needed to learn. As we were showcasing our work, it was clear that two of the students in the class were advanced. Like really advanced. Like using green screen effects to create life-like explosions advanced. Cool. So, while the rest of the class continued to inquire into basic editing skills, two of my students worked to create a lesson on using green screen effects. Yesterday, the first student showed us how to add a smoke effect to our film. Me (as a Dragon) breathing green smoke in the hallways. Beside the obvious leadership opportunity for the student leading the class and the skill acquisition of the learners, there were some amazing side effects to turning over the teaching to my students. The vibe in the classroom was so relaxed, so communal, so…non school like. Power dynamics between me and the students were gone and, as someone new to the school, it allowed me to really connect with the young men and women in my class on the level of a learner, rather than an “expert”. We were all vulnerable, all making mistakes, all growing our understanding together. This has provoked me to turn the teaching over to my students for future classes – but not in the common, inauthentic practice of students teaching each other things that I already know, but the authentic practice of a person who has the expertise leading the entire group of learners. I’m excited see the community that develops during these experiences and I’m especially excited to flatten the dynamics in my class and be one of the learners. Have you tapped into your students’ expertise and allowed them to lead the learning? How did it go? As we all look forward to the start of the school year, many of us single-subject teachers’ thoughts drift to what our course will look like. Where do we start? Where do we end? What are the key skills we would like to include in the year and how will we assess our students’ acquisition of these skills? A lot of time and energy goes into creating these outlines and they are designed with best intentions. The only issue? They are often designed for students, rather than with students. This has potential challenges, as it can frame learning as something we do to our students, rather than something they take control of for themselves. In this case, I am suggesting an approach by which we work together collaboratively with students to design the course. Here, we often need to take a balanced approach as most schools have external requirements that they need to meet that students might be unaware of. One approach that I used with my MYP 4 Media class was to create a draft course outline – one that contained a range of skills and concepts that I thought might be important for students to inquire into over the course of the year and that took into account external requirements. Then, during our first class together, I presented students with this draft course outline and asked for their feedback, in the form of a Compass Points VTR. A simple activity like Compass Points can really empower learners. In less than 15 minutes, I had valuable data on what students saw in my draft that interested them, what they already knew how to do, what they were not interested in and things that didn’t appear in my draft that they wanted to learn. By providing them with a draft framework, I was able to provoke their thinking and open their minds to possible inquiries that they might not have thought of, while at the same time keeping my own mind open to their interests, experiences and opinions. Right off the bat, this helps establish an environment that is based on a collaboration of learners, rather than the typical “teachers knows best” dynamic that we can all fall victim to from time to time. Further to this, the practice of planning with students suggests, “this is your learning” and empowers them to be active participants in the entire process of learning – from planning, to skill acquisition, to assessment, to reflection and celebration. How will you work with your students to plan your courses this year? Do you have another model of collaborative planning that you have used with students?